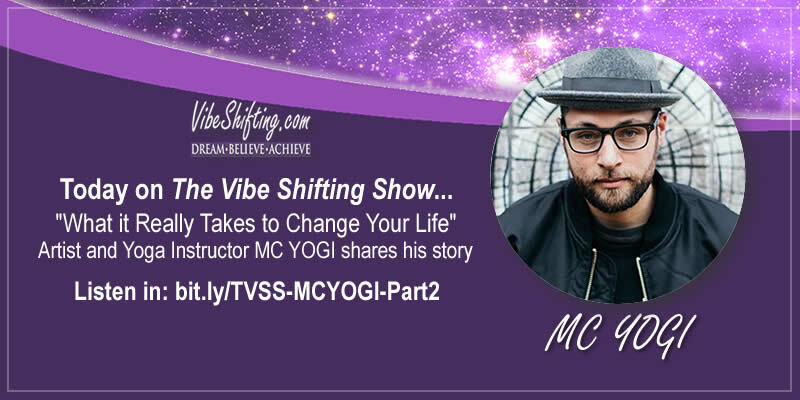 In today’s episode, part two of my interview with world-renowned yoga teacher and performing artist MC YOGI, we’re talking about what it really takes to change your life. In our chat, he shares the three critical keys that helped him turn his entire life around (and how yoga became his lifeline when he hit bottom). He also shares his views on how and why you need to find your passion in life and talks about his new book, Spiritual Graffiti. If you missed last week’s episode, part one of my interview with MC YOGI, we talked about the history of hip-hop music and how it started out as a positive force for creativity and how art is always a reflection of our internal landscape. He also shared his thoughts about participating in the 2017 Women’s March and talked about teaching yoga in China’s Forbidden City and at the White House during the Obama years. You can catch that interview right here. Nathalie: So, let me ask you some more about the yoga. How old were you when you started practicing yoga? MC YOGI: So, I lived in a group home for about two and a half years. Nathalie: And this was… Again, in your book you mentioned you were arrested for vandalism. That’s how you ended up there? MC YOGI: Yeah, it was like a chain of events. Drugs, violence, graffiti. In the book, Spiritual Graffiti, I talk about all the things that kind of led to me going into the group home. Nathalie: Yeah, there was quite a lot. You had a string of very difficult things happen that sort of, I think, set off all this stuff later. MC YOGI: Yeah, but it was all… You know, looking back in hindsight, in retrospect, I could see that all those things were in some ways necessary. They led me to where I am today. But I had to be able to develop some skills and some muscles in the process. And I didn’t let those things drag me down. I had to turn those things into a… I had to turn every curse into a blessing. So I had to process all that stuff and that was really where my practice kicked in. MC YOGI: And, to answer your question, I was 17. I had just left the group home and my dad had been practicing yoga and I stumbled into my first yoga class thanks to him. And I felt like I had found an island of peace in the middle of my life. I had never experienced that amount of bliss before, and joy and ease, without the use of drugs and without any negative side effects. And so when I discovered that, when I had that experience in my body, in my bones, in my blood… When I realized you could feel this way without all that other stuff I became, essentially, hooked. I was addicted to yoga. I wanted to practice and meditate every day as much as I could because it became my lifeline. I feel like it saved my life. You never really think about how much of an impact something that simple can have on somebody’s life, on somebody’s mental state, on their health. It’s extraordinary, really. MC YOGI: Well, for me it’s like I was living in the dark for so many years and then I finally opened the curtains and I felt all that light flood my house and it was like I didn’t realize I had been in the dark this whole time. And the curtains that I was living behind were my own thoughts, my own mind. It was this heavy, thick, dense veil. And I was just wrestling with the curtains all the time and I didn’t know you could just move them out of the way and let the light in. And when I started to meditate and practice yoga, I began to develop these skills of being able to get out of my own way, being able to calm down, become grounded, breathe. Just reconnect with my body. Just become more centred, more calm. And, honestly, that’s when my music started to change because music is always a reflection of where you’re at. And when I started to shed all those layers, the suffering and the pain, my music and my art started to transform and started to become more light- filled as well. And it’s always a reflection. And so I always feel like my music is my kind of my journal. The things I’m into at that moment are what I’m singing about and rapping about. Nathalie: So at what point did it change from being just this way of processing what you were going through, as something you did on your own, to becoming something more than that? Because you seem to be on, you say in your bio even, that you’re on this mission to bring good energy into the world, positive energy into the world. So, when did that shift start happening for you? At what point did you realize that this that this was something bigger than you? MC YOGI: Crystal meth was becoming really popular and where I lived and I had friends who were some of the biggest drug dealers in our area who I was best friends with and I was running with them. And I had other friends who were joining the military and going off to war, and I had a couple of friends commit suicide and a couple of friends… my best friend ended up in prison. And so I was looking around and I started to realise that if I just continued to do the same thing that I’m doing now the outlook is not very good, it’s pretty bleak. And so I decided… I had this desire to change. I wanted to do something different. Because I’d always been an artist and I always wanted to know what it would be like to live an artistic life. 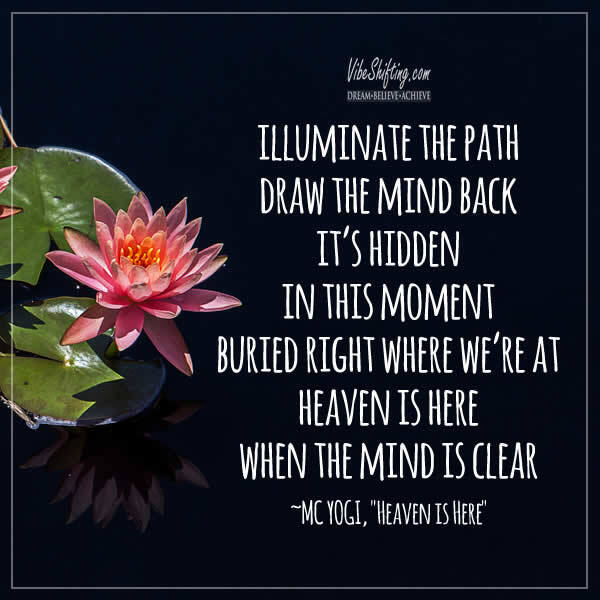 MC YOGI: But everyone around me that I was hanging out with at the time, and they were good guys, but you know they were on a more self-destructive path, or just not having a goal or a vision or a desire or a dream that they wanted to pursue. Like music or art or anything like that. So I decided the only way that I was going to shift and change is I had to change my environment. And so I ended up going to the group home and that was the beginning of the change that set me on the path that helped me to become even open to the idea of doing yoga. Because when I was growing up I never even knew about yoga and meditation. The only time I ever heard the word “namaste” was on a Beastie Boys record. MC YOGI: And then, finally, when I found the practice, I really… I clung to it with everything I had because I realised this was going to be my way to freedom. This was going to be what I needed to practice in order to change and transform my life from the inside. And that became my life. And my life just radically transformed, 360 degrees. Everything changed around me. The people I hung out with, the places I was going, the food I was eating, the way I was dressing, the music I was listening to, what I was fascinated by. Because I was changing inside, everything on the outside – the reflection – was changing. And it happened pretty quickly. I have to say, in just a couple of years everything radically shifted. And I began to write music in a more vigorous way and then I put my first record out and it became sort of like a breakthrough hit in the underground world of yoga. And, yeah, it’s just been kind of an unfolding adventure and journey from there. Nathalie: Now, have you ever put any thought to what it was that gave you the ability to do all that? Because it’s not… yours is not… I mean, it’s unique in the sense that everybody’s story is unique, obviously. But there are so many kids who are in that situation where they’re dealing with the darkness and the drugs and the violence and the gangs and all this stuff. But they just can’t seem to get out of it. MC YOGI: Not everybody is going to make it. That’s just the reality. Not everybody is going to make it because not everybody has the desire to make it. And what I realised is, for me, it was a combination of things. MC YOGI: I grew up in a working class family where there was a culture… my grandfather was a self-made entrepreneur. My mom was… immigrated from Portugal and they didn’t have any money, they didn’t speak any English. And so my family was really all about working really hard. And that was modeled to me from an early age. So I had this impression that if you want something you have to work hard. MC YOGI: And then because my dad started practicing yoga, he modeled to me what it what it was like to be a yogi. Even though he never told me about his practice, I just saw that he was more happy and blissful. And so I got sort of attracted to that and I started questioning him. And so it was that combination of me, myself, getting to a breaking point, hitting bottom where I was like “I can’t go on doing the same thing anymore” and then having the experience of people in my family working really hard, and then seeing my dad do yoga. It was those three things where I wanted the change, I knew I was going to have to do the, be the change, and I found yoga which was my sort of technology for creating the change. 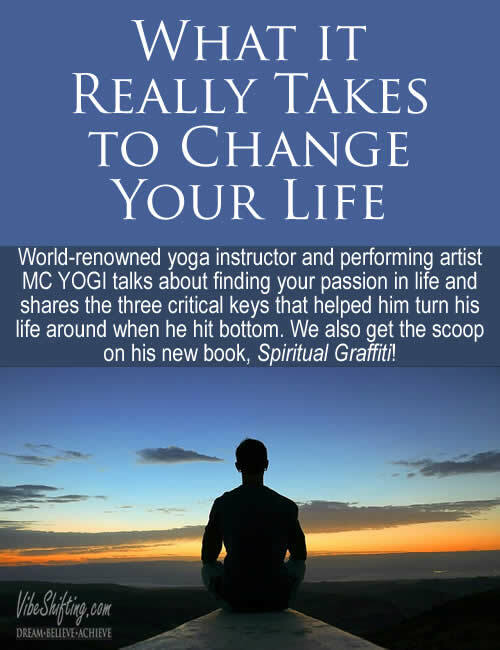 MC YOGI: And so those three things led to me becoming a success because if I hadn’t had any one of those things it would have been very difficult for me to pursue my dream of being an artist. Because if you don’t work hard, you know, no one else is going to do it for you. And if you don’t have some desire, some burning passion to really do it, no one else can give you that fire. And if you don’t figure out that there are practices, tools, and techniques like meditation then it’s difficult. And I really give credit to those three things that helped me to, essentially, help myself. Nathalie: What would you say to kids who are… or not even kids but anybody, really, who is looking for that burning passion of something that they want or need to do but haven’t found it yet? Do you have any words of advice for anybody who’s in that situation? 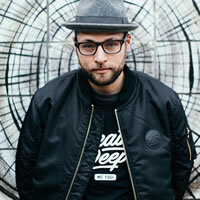 MC YOGI: I don’t like to “should” on people. I don’t I don’t like to tell people what they should do because I don’t know. For a long time I didn’t know what I should be doing, what I was supposed to be doing. But I’ll go in and I talk… I go in and work with the kids in juvenile hall and I go back and talk to the kids at my old group home. I was there a couple weeks ago. And basically all I can share is my own experience, which is really why I wrote this book, Spiritual Graffiti, because it kind of maps my journey. You know, that was the question that Steve Jobs asked himself. He pursued studying typography in school and it didn’t make any sense, but he just really enjoyed typeface. And that’s kind of what helped set Apple apart from the PC and all that stuff, like Windows. And so, for me, I just really loved doing graffiti. And graffiti was illegal, and it didn’t make sense, and everyone said I shouldn’t do it. But, looking back, I was able to transform that graffiti aesthetic and all the skills that I develop as an artist into my music and into my becoming a teacher. So, the first question is what is it that you really love doing that you would do even if you didn’t get paid to do. What do you want to do when you wake up in the morning? Do you love reading? Do you love writing? Do you love taking pictures? Do you love [can’t transcibe]? Whatever that is, you’ve got to get clear about what it is, because for me it was art. MC YOGI: And then the second thing is you have to develop this hunger to get better at that thing. You have to become hungry to master that craft. And no one can really create that passion for you. There has to be some kind of spark. And the way that I’ve sort of fanned that flame inside myself was to really look at people who are hungry in that way as well. Like when I listen to, you mentioned Bob Marley or, you know, talking about John Lennon, any of these great artists. 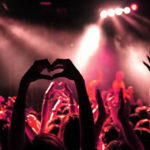 They had this desire to be better songwriters, to create better songs, better music. 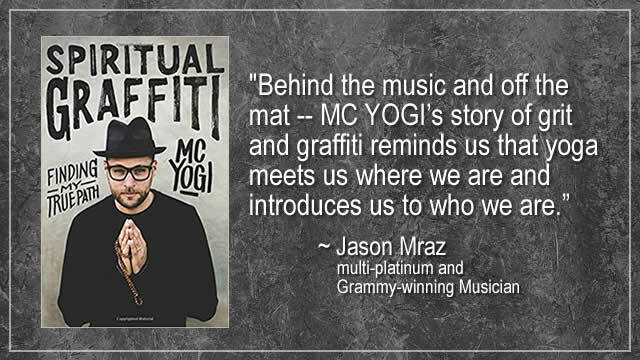 MC YOGI: And so, part of the path is you have to surround yourself with people who are in that sort of category. Because it’s like, for me when I was growing up, I was surrounded with kids who were more interested in the self-destructive path, so that became my environment. So you have to change your environment. And that begins by really changing the internal landscape. You gotta decide for yourself, do I want to continue to be like this, or is something else possible? And if something better is possible, who are the people that exemplify that who I could look to in order to help fan my flame? Not to rely on them, but to look at them as an example. And then do it in your own way. Nathalie: Wow. 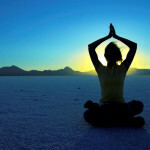 So, I would think that the yoga and meditation would probably be extraordinarily helpful in getting to that stage because it would give you that sort of quietness, that calmness, to actually look inside and to get in touch with that area within you. Because I think a lot of people, they just, they don’t know what it is that they want to do anymore. MC YOGI: And even now, I still don’t know. I still go through bouts of… I’m working on a new record right now. I don’t know which direction to go. I don’t know the style and all that kind of stuff. So the practice of yoga meditation turns a floodlight into a spotlight. 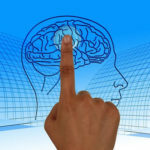 It gathers and collects your mind and you point it back in toward the center of your life and reconnect with your center. Like what’s central, what’s essential. 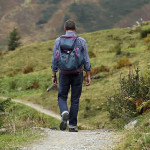 You reconnect to what’s that beating, pulsing, burning light in the middle of your life. And when you connect to that, you instinctively and intuitively know what to do and where to go. Because when you practice yoga and you listen your breath and you’re moving through postures or you’re sitting and meditating, you’re getting in touch with your own inner voice, your own intuition. MC YOGI: It’s what Gandhi calls “the still, small voice”. And that voice is the voice of truth. It’s the voice that, regardless of all the other voices in the room that are loud and obnoxious and judgmental and critical and biting amd competitive, that quiet voice that’s underneath all those voices… you want to be able to focus on that inner voice, that intuition, so that it becomes louder than all the other voices. 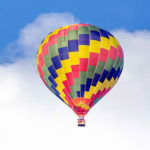 Oftentimes our thinking mind is above our breath. In yoga, you’re putting your breath above your thinking mind so that you’re quieting those voices until the breath becomes the loudest sound. It’s the “Conquering Lion” is what we say. It’s the lion that conquers the chatter of the monkey mind. And when that sound gets so loud and so prominent it’s the voice of truth because it’s… your breath is the voice of nature. You know? It’s authentic, it’s real, it’s true. And it’s connected. MC YOGI: So when you’re following that voice, that’s what’s going to point your life in the right direction. And you have to keep coming back. Or I have to keep coming back over and over and over and over and over again because that is essentially why it’s called practice. It’s just not… It’s not given. You have to develop that skill because there’s so many layers covering our truths that we have to develop the ability to clear all that stuff out of the way so that we can come back to our own voice over and over and over again and develop that confidence based on experience. Not blind faith or false confidence, but real confidence based on scientific experiments. You’ve got to produce the same result over and over and over again to know that it’s real, to know that it’s true. That’s why yoga is called a science. It’s not even really a religion, it’s a practice. Nathalie: I love that. Wow… you have given us so much today. This is incredible. And I’d just love to wrap up here talking about your book. Because this was released not all that long ago, Spiritual Graffiti, and it chronicles your journey from… I’m going to read this right off here, “from a chaotic youth to leading a purpose-filled creative life”. So, everything that we’ve talked about today, your story and your very inspirational way of looking at things, people can read up on that in your memoirs. MC YOGI: It’s true. And, you know, we kind of covered some serious ground, but the book, I also want to say, is pretty funny. There are some really entertaining moments, and there are some twists and some turns and some unexpected things. And I’ve had a lot of people come up to me because it just came out recently. But I had one woman, in particular, she said… A lot of people said they read this book in two days, which was kind of unheard of. Usually it takes a long time to read. But people… it’s like a page-turner. Nathalie: They couldn’t put it down. MC YOGI: Yeah and one woman said she read it two hours underneath her sheets with a flashlight, and I was like… you know it took me a year to write it and you read it in two hours, that’s amazing! But I thought that was pretty cool. Nathalie: That’s awesome. So, the book is available pretty much everywhere books are sold. It’s online, it’s on Amazon, and I will put a link in the show notes today if you want to check out the book. 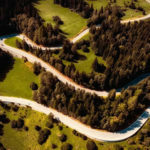 And we’ll also put in links to your Web site and your social media contacts so people can track back and connect with you there. Nathalie: Maybe that’s the next one? MC YOGI: I think so. Maybe a graphic novel. Nathalie: I just want to say thank you again so much for being with us today. I really appreciate you taking the time out to talk to us, and we’ve learned so much from you. Thank you so much! MC YOGI: Likewise. Thank you all. Much love, Canada! Peace.